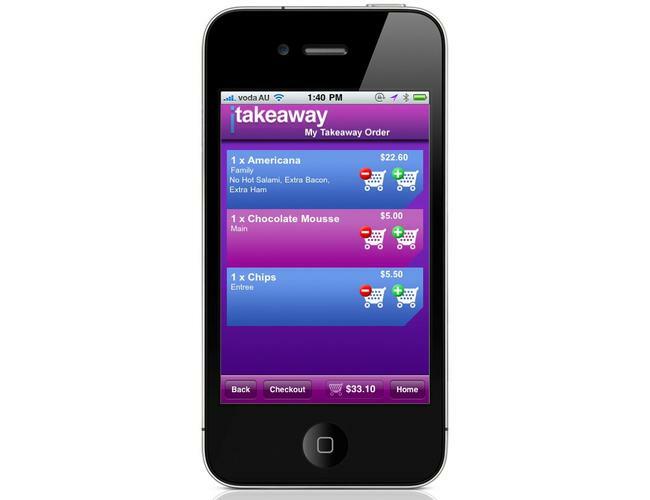 Australian-designed application iTakeaway lets you order a range of fast food from your iPhone, iPod Touch or iPad. An Australian-designed application that allows users to order take away food via an iPhone, iPod Touch or Apple iPad launched this week. iTakeaway is a free application available through the Apple App Store and offers users access to menus from restaurants that have registered with the app's developers. Currently, more than 300 restaurants are part of the service. Customers can place an order and make their purchase on the spot, or they can have the food delivered to them if they live nearby. Orders can be placed with any listed restaurant up to seven days in advance. The chief executive of iTakeaway, Tony Peter, said the app was designed to simplify takeaway operations for both the user and restaurateur. "We felt there was a need to develop apps for this market. We thought there was a very large gap for this as more and more people need to order their food from home," he said. "The Apple platform is an extension on our capabilities. All the information for restaurants and take away places is on our Web site; if they have registered with us they can hop online and change any prices, information or menu list as they please." "This was all developed for small to medium-sized companies who couldn't afford to make similar apps themselves," Peter explained. "While we were developing this app, Pizza Hut and Dominos released their apps, so we were always established to get this to the mass market." iTakeaway is one of the first takeaway food service apps available on the iPad. Restaurants and takeaway stores can register to the service by contacting iTakeaway through its Web site.